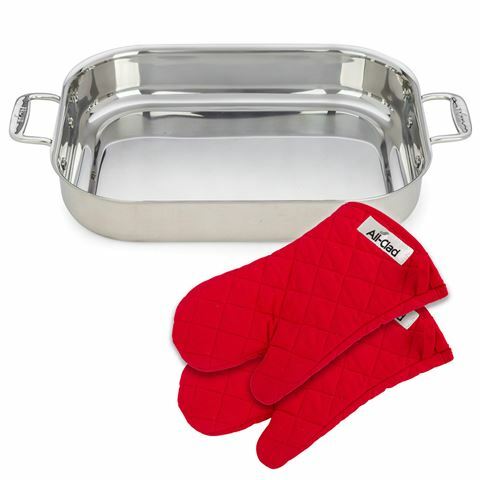 All-Clad’s new Lasagna Pan is the perfect cookware piece, whether you’re a seasoned chef or an aspiring home cook. Crafted from heavy-gauge polished stainless steel, this pan comes with two ergonomic handles for easy portability from oven to table, while the easy to clean surface will not react with food. And as an added bonus, included with this pan are two red oven mitts to keep you protected while crafting masterpieces. Crafted from heavy-gauge stainless steel. Stainless steel surface won’t react with food. Dimensions: 45.5cm (l) x 6cm (h) x 30cm (w).